Soak the white rice in hot water for 5 minutes. Drain, rinse with cold water and drain again. In a cooking pot, heat the oil over medium heat until hot but not smoking. Add the angel hair and fry for about 2 minutes, stirring constantly. It should be browned but not burnt. Incorporate the drained rice, cook for 3 to 4 minutes, stirring occasionally, until the rice achieves a milky white color and it feels and sounds heavier when you move it. Add the chopped onion and garlic, stir and cook for another 2 minutes. Pour the water or broth over the rice, add the salt and lime juice, and once it comes to a boil, reduce the heat to low, cover with the lid, and cook for about 20 minutes. 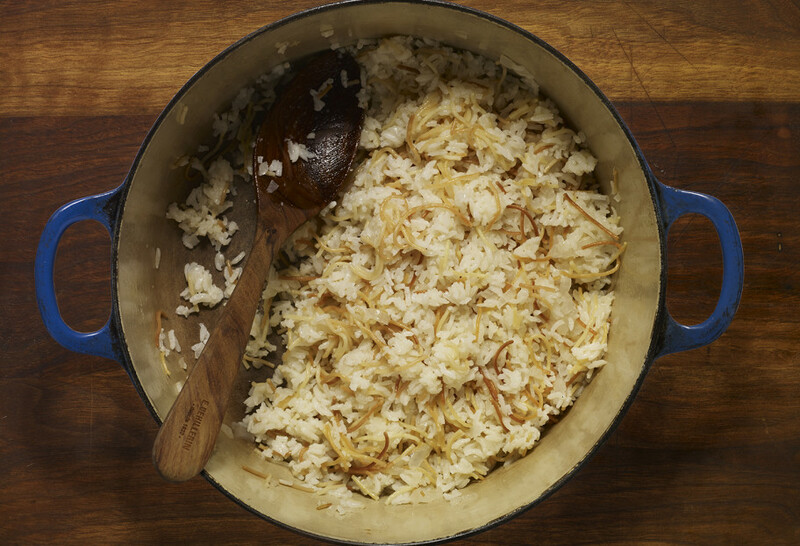 The rice is ready when the water has been absorbed and the rice is tender and cooked. Turn off the heat and keep it covered for at least 5 minutes. Fluff with a fork and serve. This is a wonderful recipe! Thank you Pati! Where can I find your Mole Coloradito recipe?